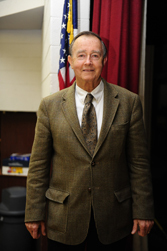 A vote to reinstate Brick Board of Education member John Talty to his elected post has failed. Talty resigned last month after his recovery from open heart surgery was not moving as quickly as he expected, but in recent weeks, he regained much of his health and expressed an interest in rescinding his resignation from the board. Talty was present at Thursday night’s board meeting. Members of the public were allowed to speak on the matter before the board voted in a 3-3 tie to rescind Talty’s resignation. The tie, board attorney Jack Sahradnik said, meant the motion failed and Talty would not be reinstated as a board member. Sahradnik, for his part, said a review of case law resulted in him not recommending the board entertain a rescission. Board members John Barton, Frank Pannucci, Jr. and Michael Conti all voted against rescinding Talty’s resignation; board members Karyn Cusanelli, Susan Suter and Board President Sharon Cantillo voted in favor of it. Speakers from the public, likewise, were divided on whether Talty should have been able to rescind his resignation. But most acknowledged that Talty was a top vote-getter in the election where he won his seat. “There should be a special election, and if he still has the support of the people, he will win,” said Patricia Marsden. “Bricktown just doesn’t have the money” should someone have challenged the reinstatement which would have racked up legal bills. Talty had served several terms on the board. He first began serving in 2004, when he was elected as part of a ticket with Cantillo. The pair defeated incumbents John Bendokas and Brian DeLuca that year. His latest stint began in 2010. Some members of the public said Talty’s experience was needed as the board navigates the precarious situation in which the district has found itself in the wake of the arrest of Superintendent Walter Uszenski. Others said Talty’s reinstatement should not have been considered because he voted in favor of hiring Uszenski in the first place. But Barton, Pannucci and Conti all said that since Talty had already submitted his resignation and the district began to advertise for a replacement, the legal process should be followed. “He should put his resume in, just like everyone else, and go through the process,” Pannucci said. When a board member resigns their post, the remaining board members are responsible for selecting a replacement to serve until the next board election is held. Resumes are being accepted through June 1, after which the board will conduct interviews and appoint the replacement. Talty would be eligible to interview to be appointed back to his own seat. It was not immediately known whether or not Talty had, or planned on, submitting his resume to be considered.